Crewest Gallery News: Meeting of Styles: LA!! So we are helping to organize a historic event. 100+ artists unite to paint huge graff mural in the L.A. River! 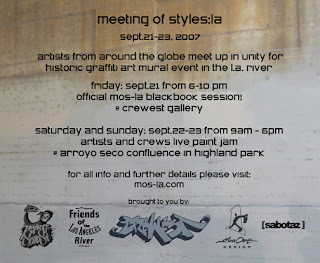 will be painting at the "Meeting of Styles:LA" event. The Official MOS:LA Kickoff party and Blackbook Session will be held at the gallery on Friday, Sept.21st from 6-10pm.